Journey along with Team Avatar as they rescue a pumpkin farmer waylaid by monsters, help an old rival with a hair-raising problem, and reflect on what it means to save the world. Featuring the work of Gene Luen Yang, Faith Erin Hicks, Carla Speed McNeil, Ron Koertge, Dave Scheidt, Sara Goetter, and more, this anthology features stories both hilarious and heartwarming. This volume also includes the short stories, 'Rebound,' 'Shells,' and 'Sisters,' previously released for Free Comic Book Day and never before collected! 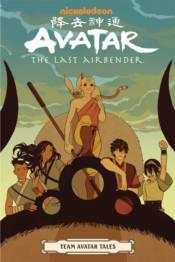 o Gene Luen Yang, longtime Avatar writer, draws an Avatar story for the first time!